Recent stock market action has been notable for its lack of volatility. Moreover, the selloffs that have occurred were quickly met with buying as a “buy the dips” mentality has come to dominate stock markets. The most recent example of this was in mid-May when the Dow dropped some 400 points, but had totally recovered this loss in a mere five days. Complacency has come to rule the stock markets, and we believe that we are witnessing peak complacency right now. The stock markets have had many of the traditional reasons to go lower this year. Turmoil in the White House has hardly caused investors to blink an eye, despite the fact that the Trump agenda keeps getting pushed farther onto the back burner as revelations occur almost weekly about Russia’s influence on the US election and how much Trump’s circle knew (or did not know) about what was happening. Congressional energy has therefore been consumed by investigations and hearings into these matters, and diverted away from the legislative agenda. Health care reform, tax reform, and deregulation all seem to be a bridge too far at the moment. But this hasn’t dented the investor optimism that greeted his election, as they have bid stock prices up to marginal new highs in mid-June. On the economic front, company earnings have been rather vibrant, providing fuel for the bullish case. But this is somewhat counterbalanced by jobs creation statistics that have come in well below forecast for several months in a row. Can it be that today’s low unemployment has created a situation where companies can’t find enough workers, thus impacting their ability to create jobs? Possibly, but in times past the jobs disappointment would have caused some wobbling in stock prices. Complacency has overwhelmed any worries about economic performance. One need only look at the VIX, or volatility index, to gain insight into today’s sentiment. The value of the VIX, commonly called Wall Street’s “fear index,” relates to the cost of insuring against asset-price movements via the options market. The VIX is tied to movements in the S&P 500 index. While the underlying asset price and the length of the option contract determine pricing, so does expected volatility of the asset. This “implied volatility” is the number captured by the VIX. If investors are indifferent about insuring against market declines, then premiums will fall. Conversely, when the S&P 500 falls, the insurance premium (VIX) rises. The biggest influence on the VIX movement is the behavior of markets in the recent past. If markets have been calm, then investors will not be willing to pay high premiums to insure against downside movements, and the VIX will be low. And markets have been very subdued lately. There have been few times in history where the major indexes have traded with such little downside movement. In early May, for instance, the S&P 500 moved less than 0.2% in ten out of eleven trading days, the least volatile period since 1927. This trend has presented one of the biggest puzzles on Wall Street. As political risks have increased both at home and abroad, complacency has rarely been so widespread. The VIX reached a high of 22 in the days before the presidential election in November 2016, but has trended steadily downward since then. This culminated in early May when the VIX dropped below 10, the first time it had done so in more than ten years. At current levels, the VIX reflects a striking sense among investors that the persistent rise in stocks will continue, regardless of the election fears in Europe, and concerns here that Trump may not be able to deliver on his ambitious economic agenda. Why have investors been so willing to ignore so many outcomes that historically would have sent stocks reeling? The decoupling of increased political risks and investor lack of worry seems to be a rock-solid belief that the surge in “soft” economic data, such as consumer and business sentiment, will be followed by improved “hard” data, that is, increased sales of products and rising wages. This means that even though Trump has had difficulties getting his bills passed, investors are not willing to abandon the stock market. Investors are starting to refer to this as the Trump “put,” which refers to the fact that a “put” option gives one the right to sell a security at a certain price. In other words, it puts a floor under the potential price decline. When Alan Greenspan was chairman of the Federal Reserve, the “Greenspan put” was popularized by the belief that the Fed would bail out a sinking market by cutting interest rates and adding liquidity to the banking system. Thus, investors felt comfortable taking on more risk, knowing the Fed would bail them out. The ultimate bail-out, of course, occurred after 2008 when the Fed engaged in “quantitative easing” and printed about $3.5 trillion of new money over the next six years. The Trump put has its roots in the business-friendly attitude of the president, and his willingness to sacrifice more than a few sacred cows to get his agenda in place. After all, no one can accuse him of being afraid to take risks to disrupt the political monolith in Washington. The prevailing view seems to be that whatever happens, he will do things to spur economic growth. This idea has some support from the Federal Reserve of Atlanta’s GDPNow forecast. This research, highlighted in the May Market Outlook, is a real-time forecast of the current quarter’s GDP (Gross Domestic Product). By updating the various GDP components as they are reported, it provides a timely, and remarkably accurate, tally of current economic growth. 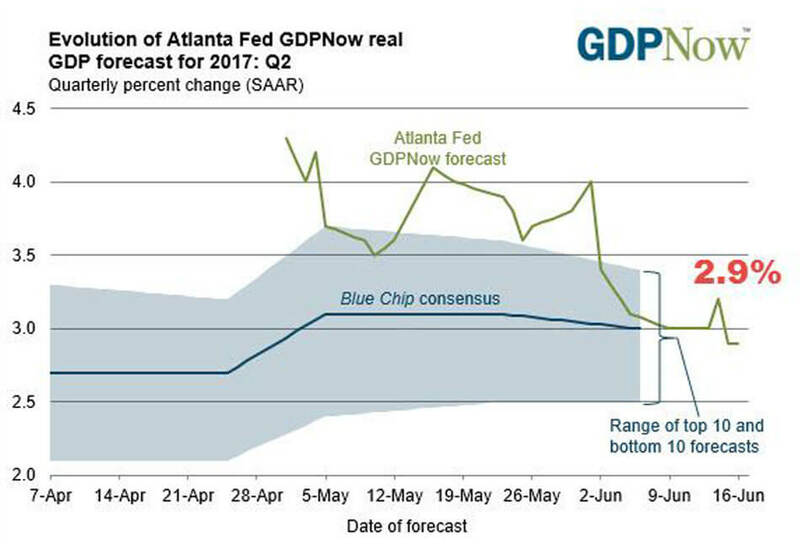 In contrast to the first quarter’s dour result, the second quarter seems to be snapping back, with the GDPNow forecast currently at 2.9%. This measure tends to start out high, and then fade a bit as the quarter progresses simply because in the early part of the period there are not that many data points that feed into the forecast. As the quarter rolls on, and more data come in, the growth forecast is refined. The current forecast of 2.9% should provide pleasant reading for investors who have stayed the course in the stock market. A contrasting view comes from the bond market, just to add another ill-fitting piece to today’s difficult to forecast environment. One of the widely ascribed forecasts since the election was that interest rates must “inevitably” rise as the Trump agenda took shape. As a result, high-quality, interest-sensitive bonds of all types fell in late 2016. The widespread belief in this outcome led to a complacency that ignored one glaring fact by the midpoint of this year: yields have fallen back to their pre-election lows. Far from being a disaster, bonds have had decent returns in 2017, since bond prices rise as interest rates fall, and are sending a message that is opposite that of the stock market. One reason is that the consumer inflation that was expected to rise in 2017 has not materialized, and in fact has moderated a bit. The year-over-year headline Consumer Price Index came in about 1.8%, below the Fed’s target of 2%, and below the previous month’s inflation rate of 2.2%. The expectations of higher inflation have been dashed, and bonds have reacted favorably as a result. A look at the retailing sector may provide some clues as to why this is happening. There is a wave of disruption occurring in the retail world, with traditional brick-and-mortar stores being supplanted by online sellers, the largest of which is Amazon.com. This has decimated the poorly run firms like Sears, and has put others out of business. Retail bankruptcies are on the rise, with household names such as The Limited, RadioShack, and Gymboree throwing in the towel. This has had the effect of throwing massive amounts of inventory onto an already glutted market, reinforcing the forces of deflation rather than inflation. Moreover, with the loss of stores comes the loss of jobs, and this is having a dampening effect on wage growth. Over the last year, department stores shed 29,900 jobs, while general merchandising stores cut 15,700 positions. At this rate, one Florida columnist put it soberingly, “Half of all US retail jobs could vanish. Just as ATMs replaced many bank tellers, automated check-out stations are supplanting retail clerks.” It’s not hard to see how the combination of these two related phenomenon is part of the reason inflation is ebbing. We are living in a world of contradictory indications. The stock market seems priced for perfection, with widespread complacency, little fear of downside risks as shown by the VIX, and continued record high margin debt all underscoring an unwavering desire to own stocks. Yet bond yields are sending a contrasting message of low growth and low inflation. Which scenario is one to believe? Perhaps by looking backwards, we can see visualize a way forward through the foggy mists of the future. The previous two occasions when the VIX fell below 10 were in 1993 and early 2007. The first preceded the bond market sell-off of 1994, and the other occurred just before the first stages of the credit bubble collapse of 2008. The VIX has proven to be a mean-reverting index, meaning that periods of below-average readings are followed by above average ones. 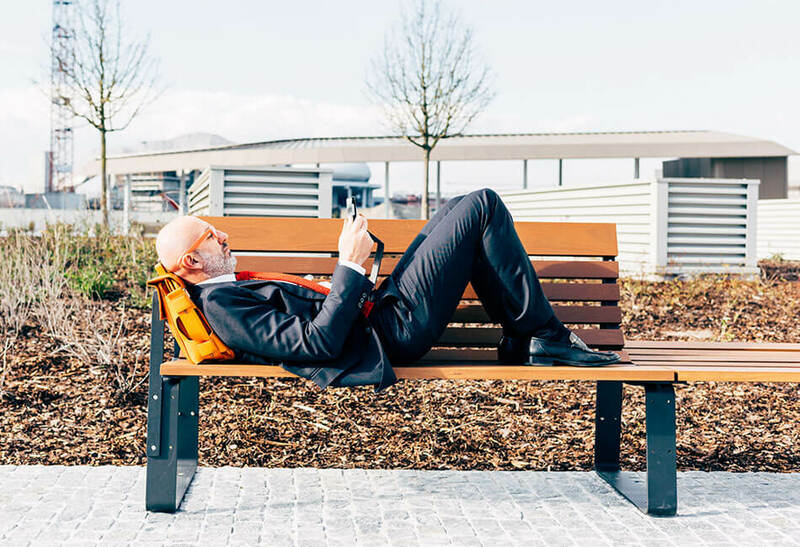 At today’s rock-bottom levels, it underscores peak complacency among the bulls, and investors would be well advised to ponder how that complacency could be shaken in the quarters ahead.